Invisibles is a European ITN project (FP7-PEOPLE-2011-ITN, PITN-GA-2011-289442-INVISIBLES (April 2012-March 2016)), which focuses on Neutrino and Dark Matter phenomenology and their connection. Experimental and theoretical aspects are also encompassed. The network involves nodes in seven European countries and its associated partners extend to seven non-European countries. Invisibles is a European ITN project (FP7-PEOPLE-2011-ITN), which focuses on Neutrino and Dark Matter phenomenology and their connection. Experimental and theoretical aspects are also encompassed. The network involves nodes in seven European countries and its associated partners extend to seven non-European countries . 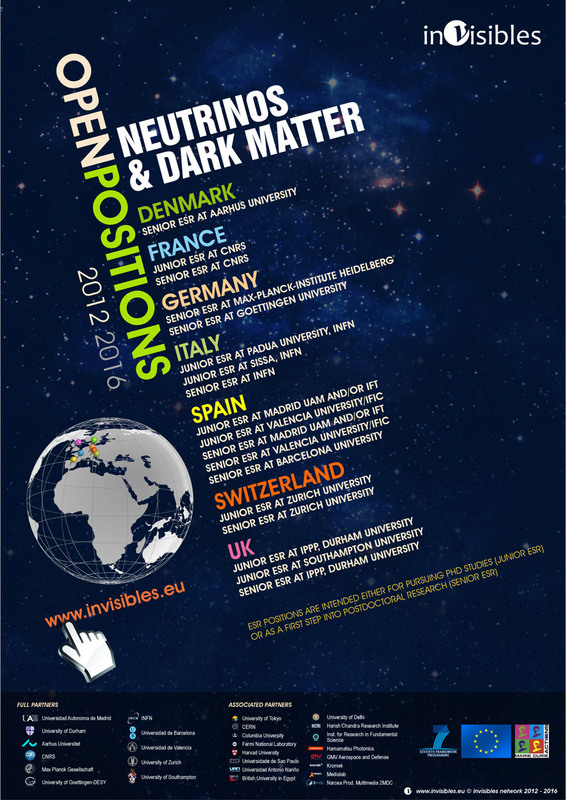 Invisibles ITN has offered several positions in the period 2012-2016, from April 1st 2012, to work on neutrino and or dark matter/energy physics. The work has been carried out in the enthusiastic environment provided by the research network of Invisibles. The positions were intended for young researchers, either to obtain a PhD degree within 3 years (which may be co-tutored between two nodes), or as a first step into postdoctoral research at the end of the PhD training. A new boson at the LHC?